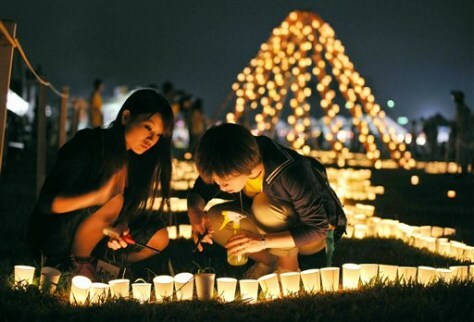 Local residents light a candle at a park during a memorial event marking six months after the March 11 earthquake and tsunami in Iwanuma city, Miyagi prefecture, Sunday, Sept. 11, 2011. As the world commemorates the 10th anniversary of the World Trade Center attacks, Sunday is doubly significant for Japan. It marks exactly six months since the disasters.